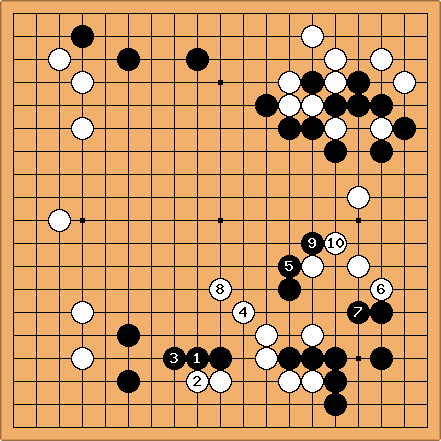 This is Dieter's analysis attempt of this second game in the final between Lee Sedol and Gu Li. Pro analysis by An Younggil is here. 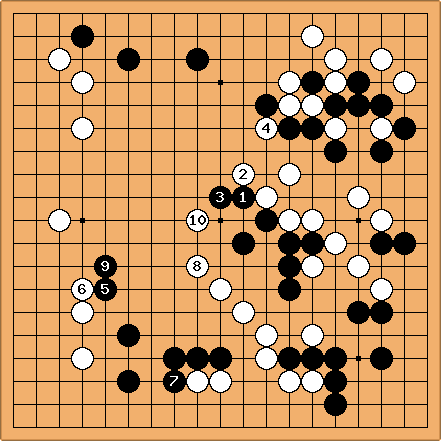 Gu Li takes White. From to we get an orthodox fuseki. takes up a symmetric position. 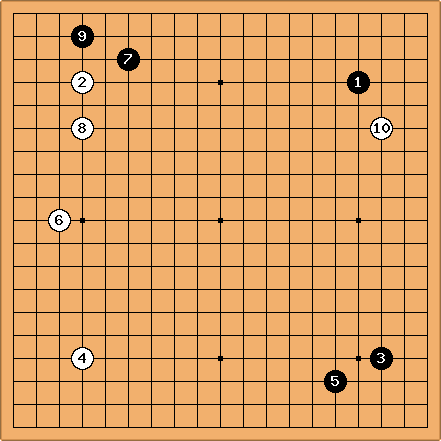 is the orthodox fuseki approach. is a special move. I would expect at a. When pushes through, it feels like White has already an advantage. 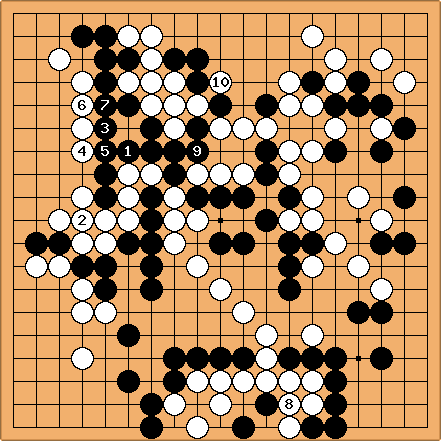 This means that building at the bottom may not have been the right priority for Black. 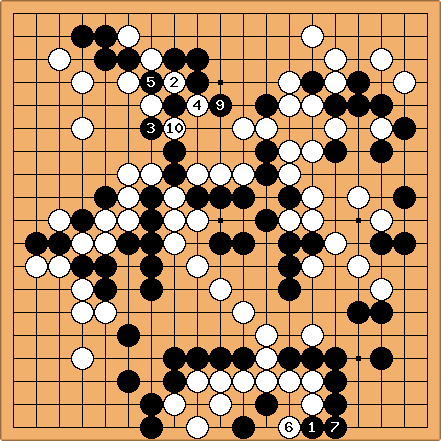 With White gets a big corner. Although it is negated by , Black's farmer's hat doesn't look too good and needs reinforcement. Probably Black expects White to answer at but invades the huge moyo before it is too late. 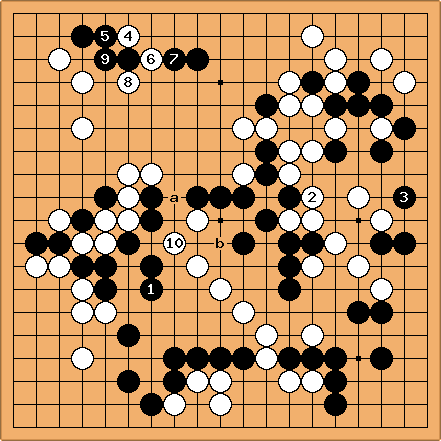 is thick but White's left side is not easy to invade as is low. A reduction at a would overlap with 's influence. is yet another invasion. 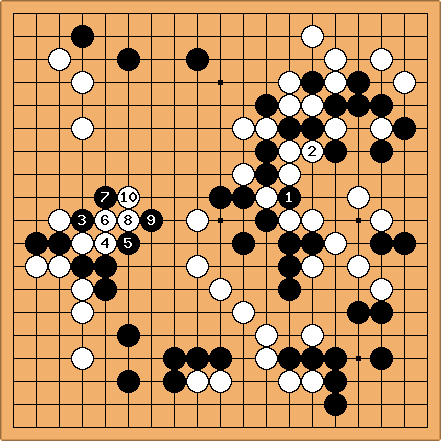 Gu Li must be quite confident that he will make both groups alive. Obviously cannot be played at , as that would be too timid. is a typical technique, aiming at both and a. 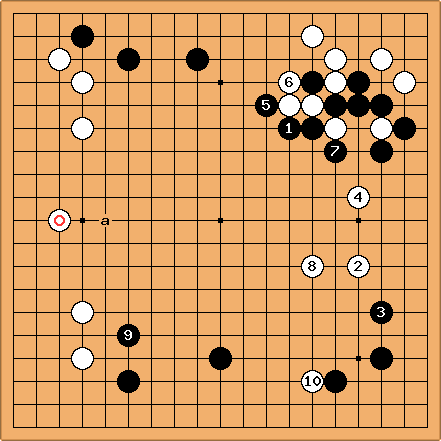 White is split up and the marked stones are light, because the invasion of a is still possible. 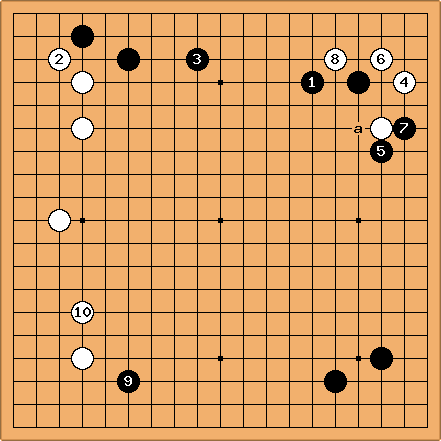 However, An Younggil sees at b in this variation, so probably should be there in my variation. and scoop out the eye space so that both White groups will have to seek solutions in the centre. Yet, as they move towards the left, White's problems will diminish. is quite an astonishing move for me. 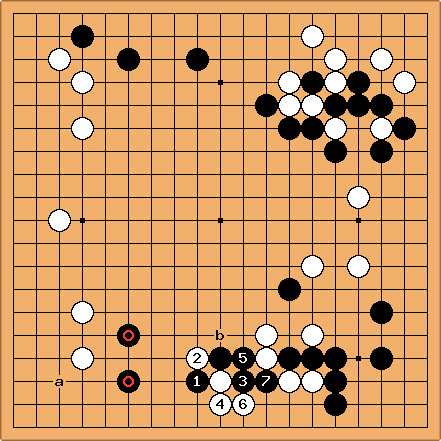 Suddenly, White's right side group seems out of danger and White only needs to care about the bottom. Even better, the cut lowers Black's overall thickness. 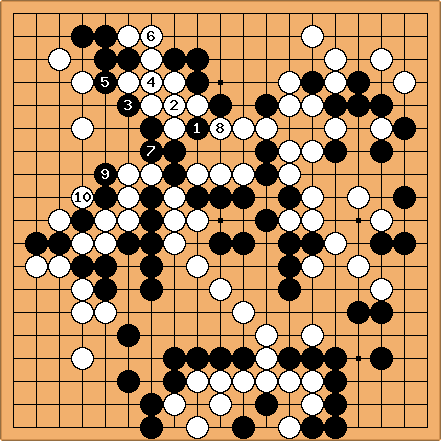 White destroys the Black group in the top left and becomes überthick. 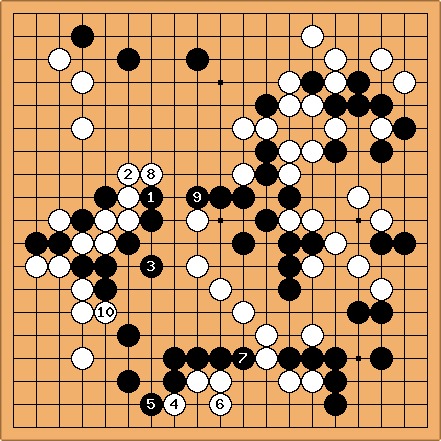 Lee Sedol must have thought that killing the dragon was the only way to reverse the game. After it's all about life and death. I don't understand why Gu Li leaves the front with here. 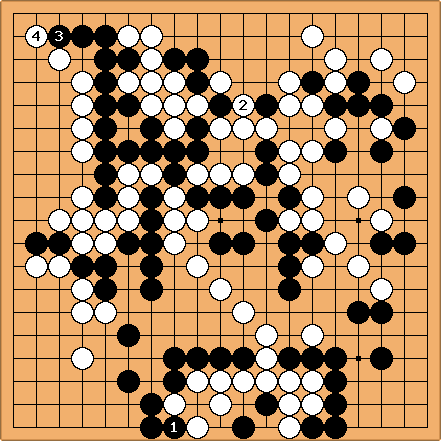 I can see how and could help a push through at a but if Black destroys the eye shape at 'b'', would White get enough compensation at the top? A rethoric question probably. 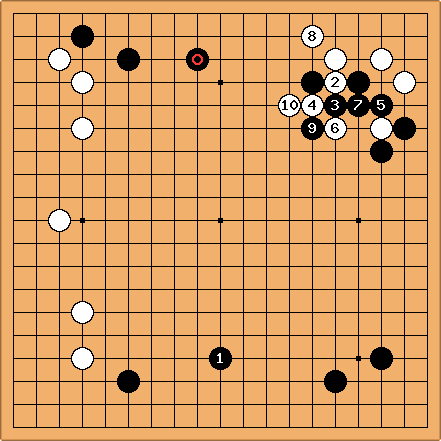 is vintage Gu Li, deciding the game with a ko. 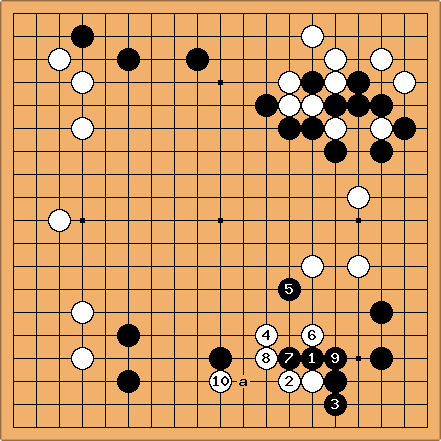 I think ko is more natural to Gu Li than it is to the majority of players. This is spectacular! Have they both read it out? It looks like a one way street, so I guess Gu new what he was doing since move 114. That means reading ahead 50 moves, still with a couple of branches!!! The music's over and we turn out the lights.